In an interview with Sputnik, Alexander Gauland, deputy chairman of the Euro-skeptic Alterative for Germany party, spoke about the political conclusions he had made about the recent spate of deadly terrrost attacks in Germany and France. “We have always said that many terrorists were coming here under the guise of refugees, that the uncontrolled arrival of people alien to our culture and tradition was a threat to our security. These recent terrorist attacks prove that we were right,“ he said. Alexander Gauland added that it was high time the authorities started registering migrants who live in the country and deporting those who didn’t belong there. When asked about who exactly was to be deported and those who deserved to stay behind, Gauland said that those who are persecuted for political reasons should be granted asylum, while all others should be sent home. There are 170,000 people currently living in Germany none of whom has been officially recognized as refugees and yet the government lets them say. The Ansbach terrorist was one of them. Alexander Gauland said that all those 170,000 should be sent out of the country, including psychologically disturbed persons, like the one who blew himself up in Ansbach. The recent terrorist attack in Munich was not directly linked to the migrant crisis though, and Alexander Gauland said that there was no way anyone could possibly guess the actions of these people. He then reiterated his demand for all such people to be deported as soon as possible. Commenting on Turkish President Recep Tayyip Erdogan’s recent interview with German TV channel ARD where he complained that his country had received only a fraction of the 6 billion euros promised it by the EU as part of the recent refugee deal, Alexander Gauland said that as long as the agreement remained in force, the sides should stick to it. “This agreement is based on international law. I consider it nil and void and would like to have it nixed, but as long as it is in force, we should honor it,” he noted. In mid-March, the European Union and Ankara agreed on a deal under which Turkey pledged to take back all undocumented migrants who arrive in the European Union through its territory in exchange for Syrian refugees accommodated in Turkey, on a one-for-one basis. In return, the 28-member bloc pledged to accelerate the Turkish EU accession bid and introduce a visa-free regime between Turkey and Europe. Under the deal, "irregular migrants" in Greece – those deemed ineligible for asylum – are returned to Turkey – on a one-for-one basis – in exchange for a Syrian refugee being relocated from refugee camps in Syria to EU member states. “Instead of running around the world pursuing goals that are at variance with our country’s interests, the Bundeswehr should defend our country, not fight a senseless war in Afghanistan,“ Alexander Gauland said in conclusion. 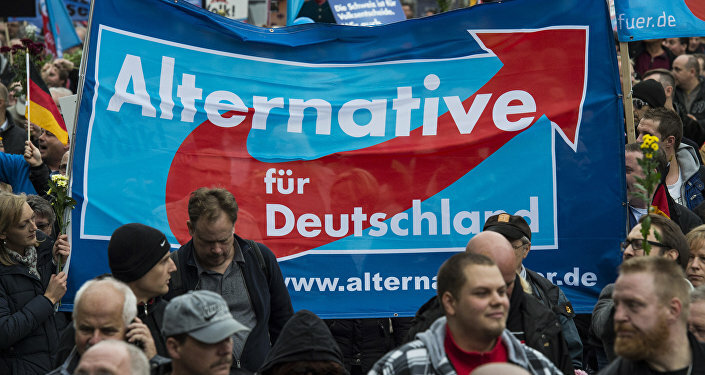 The AfD currently has seats in eight of the 16 local parliaments and is among several European parties that are calling for the anti-Russia sanctions, imposed by the European Union in 2014 over the situation in Ukraine, to be scrapped as they are counterproductive and harmful to the German economy.